Get your child involved in some of our tennis camps! We want the children to enjoy and embrace the challenges of learning the skill of tennis. We pride oursleves on delivering top quality camps with low coach:pupil ratio so that the learning experience is a valuable one. We do all of this whilst ensuring the children and happy and relaxed in an environment they feel is comfortable. We love our tennis camps and we hope you'll come to see why! What a brilliant time we had at the fantastic Academia Sanchez-Casal. The kids we took got to experience life as a full time player! 4 hours of tennis a day and 1 hour fitness with the trainers. It was an amazing experience. They worked so hard and adapted to the increased schedule brilliantly. The children got to play on both the hard courts and the red clay. 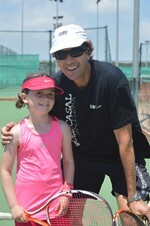 They had different coaches most days and even our friend Sergio Casal did a lot of the coaching. Sergio is very hands on at the Academy and you'll always see him on court rather than in his office. The kids kept a journal of what they learnt and have come away with a huge amount of extra knowledge that they can refer back to. It's a great experince to go and mix with other tennis players from all over the world. Our guys played matches against kids from Spain, America, Italy, Russia and more. There was never more than 3 players per coach and sometimes players got to work one on one. It's great to see kids of all ages striving to be the best they can be. It feels very comfortable walking rounds the grounds of the Academy, very safe and friendly. After only a day or two the kids felt totally at ease. The staff were fantastic and made every child feel like they belonged there whether they were a Weekly player or a full timer. Here are some snippets of our week!! Wow! What a great series of workshops! More pics of the workshops to follow!! For anyone wanting info on the Sanchez-Casal Academy please get in touch with me. Thanks to everyone who came to the workshops. Sergio, Dani, Pep & Dani were really impressed and loved meeting you all. Watch this space for next years dates and venues!